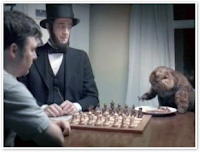 "Let's have Abe Lincoln, and a beaver playing chess. Sad that their insomniac can't visit them anymore because he can't sleep. The ads will really pull people in!" You've seen the ads. They've gotten critical praise. They're for Rozerem, a new sleep aid. Here's the problem. According to Business 2.0, they've spent $110 million advertising the drug, and sold about $76 million worth of pills. That's a losing equation to be sure. The big problem here is either (a) the creative brief (which outlines the strategy that the ad is supposed to reflect) was bad, or (b) the creative team ignored the strategy in their glee over their "clever" idea. But here's the thing: Rozerem really IS different. It's the first sleep aid that doesn't have a risk of being habit forming. So why didn't the commercials focus on that? The ads are so weird, so "clever" that when you finally get the joke, you realize it's for a sleep aid. But THAT's not the point. The point is you can finally take one without the risk of addiction. A good campaign would have left that key message in the minds of a potential consumer instead of confusing people. The agency that developed the campaign, Cramer-Krasselt, really missed the mark on this one. Whether it's the client's fault, the agency's fault, or a bit of both, we'll never know.